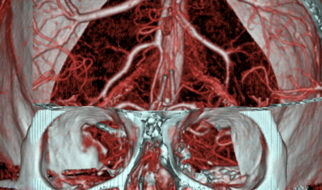 A CT Angiogram (CTA) uses a combination of x-rays and computer technology to make detailed 3-D images of blood vessels in the head and neck. The images can show weakened sections of vessels and visualize blood flow. This procedure is non-invasive and is safer than a Catheter Angiogram. Your doctor may order this test if there are suspected aneurysms, stroke or plaque build-up. The test can also be used to guide surgery, evaluate arteries feeding a tumor, or to find obstructions in blood vessels.